In the wake of CES, Samsung has started to ramp up the PR for the next big technology event, MWC 2019. More precisely it is publicising the upcoming Galaxy Unpacked 2019 which will be held a couple of days ahead of the MWC in Barcelona. It has become customary for big players in mobile technology to hold these pre-show events so their wares aren't lost amongst the cacophony of product launches at the show proper. It is widely expected that the show will centre on the upcoming Galaxy S10 and we expect the leaks about this smartphone to intensify in the coming weeks. However those more interested in the future of smartphones, thinking longer term, are fascinated by the prospect of finally seeing and hearing more details about Samsung's foldable smartphone, sometimes referred to as the Galaxy F, Galaxy Fold, or by the Samsung codename 'Winner'. Last November, at the Samsung Developer Conference in San Francisco, we saw Samsung's SVP of mobile product marketing, Justin Denison, show off a smartphone with a foldable display. The device was a prototype to showcase Samsung's Infinity Flex display technology and it worked rather slickly thanks to Samsung's new One UI which helps apps and interfaces respond to the fold/unfold actions. As MWC approaches it is hoped that the first finalised product, the Galaxy F, will be launched properly. It would be good for Samsung to get a move on as China's Royole again stole the foldable phone limelight from Samsung at CES 2019 last week. However, some have recently commented upon the Royole Flexpai's lumpy looking unfolded screen - I problem I observed last November. 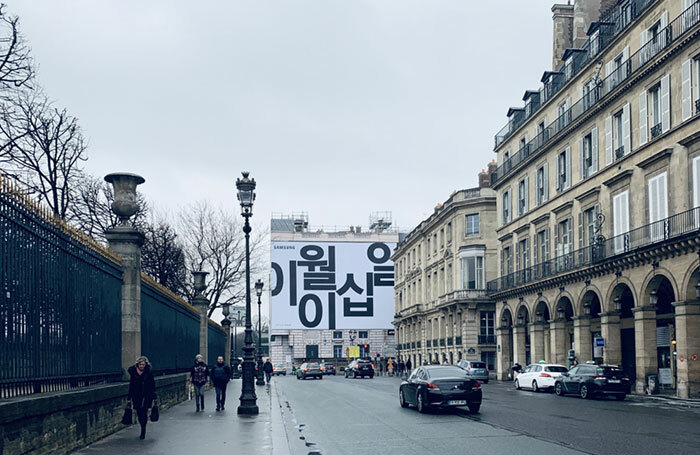 Back to the Samsung publicity blitz ahead of MWC 2019, and the firm has installed some very large billboards in Paris featuring plain black and white text written in Hangeul, (Korean characters). 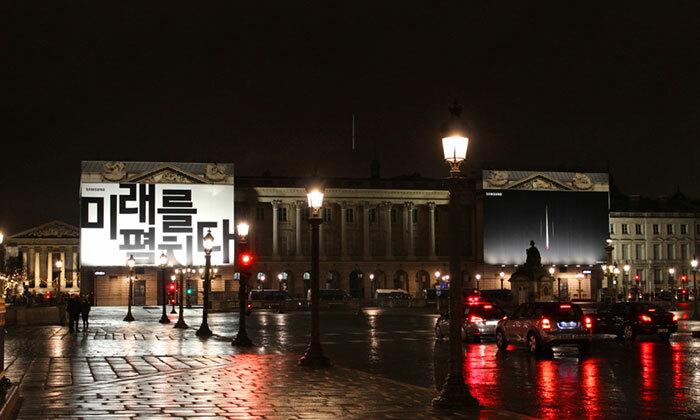 The Korean writing consists of two messages; "미래를펼치다" and "이월이십일". I didn't need any translator services to decypher this message as the Samsung news blog reveals the messages, translated to English, mean "The future unfolds" and "February twentieth." Elsewhere in the news blog we are told that we will witness "a bold new vision for the Galaxy brand that will drive smartphone innovation for the next 10 years and beyond". Surely this goes beyond a 'tease' for a foldable phone and we should expect nothing less than the launch of the first foldable phones series from Samsung. Anyone remember the Rubik Magic? This is what fold-able phones remind me of.